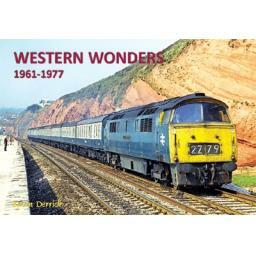 Another cracking new 96 page large format landscape colour album, this time depicting the Class 52s from their earliest days through to 1977 utilising the finest colour photographs from some of the nation's best cameramen, all supported with fascinating and detailed captions. Proceeds from this title will help to support the activities and the locomotives of The Class 50 Alliance and The Deltic Preservation Society. Inside we have colour photographs of all seventy-four Westerns taken during their heydays from their introduction in 1961 until 1977. A wide range of locomotive liveries, locations and workings have been selected to make this a real treat for fans of the Westerns, one to definitely add to your collection.